The Internet of Things (IoT) is a vast new frontier where companies are currently experimenting with fascinating new ideas and items. One of the major areas where we’ve seen intriguing innovations has been with consumer products, but other industries are poised to have revolutions of their very own. Though it may feel like a strange fit, the Internet of Things has tremendous potential when it comes to sports. From football to baseball and basketball to golf, the possibilities for how much the IoT can change sports are nearly endless. Most of these changes will likely be felt behind the scenes, but even then the impact can reach from the athletes all the way to the fans themselves. Indeed, as time goes on, the degree to which the Internet of Things is infiltrating sports may require its own branch titled the Internet of Sports. The main technology fueling these innovations involving sports is similar to that which fuels the Internet of Things as a whole. Sensors that measure everything from temperature to altitude to stress levels have become much more common in our world, but in addition to that, they’re also becoming smaller and cheaper to manufacture. The technology to connect all these sensors and analyze the data they gather has also advanced. One area where the IoT is particularly noticeable is wearable technology. People are already using wearable tech to track their fitness routines, so it’s easy to see how this can be applied to sports. Sensors can be placed on players to help trainers track their movements and progress. Sensors may also become embedded within sports equipment, which can be used to gather data on performance. For example, some Internet of Things startups are placing sensors in items like baseball bats, golf clubs, tennis rackets, and basketballs. From there, data can be collected to determine–in the case of a baseball bat–how a player is swinging and if the athlete needs to be corrected in any particular way. These ideas are already being put to use. Take the example of Major League Soccer’s Seattle Sounders. While sensors cannot be used during games, they’ve become an integral part of practice. Each player is outfitted with a vest with sensors that monitor the players’ fitness levels. The sensors generate data on two levels: the external load, which measures how much work the athlete is doing, and the internal load, which calculates how much work the body has to do to accomplish the external load. From there, team trainers and managers can tell how hard a player is working and detect instances where injury risk is greater. The team can then modify their training to reduce risk of injury and maximize training time without crossing certain thresholds. The Internet of Things is also playing a role in football. The NFL season may already be underway, but in training camp, many NFL teams made use of sensors to gather data on player speed and calorie expenditure. While some of that data may be used to reduce the risk of injury, it can also be used to discover which players are working harder than others. A spot on the final roster may be up for grabs, and if data shows a player is slacking during practice, he may not see much playing time. All this data may also end up changing coaching strategies and player tendencies as more understanding of the game is gained. While the Internet of Things can help athletes and teams, it may also improve the fan experience. This was put into practice at a recent LPGA tournament in Canada. The event was attended by about 1,500 fans who were given access to additional data, all in real time. Thanks to sensors on the golf course and advances in cloud computing, fans could be tracked and given information relative to where they were on the course. If fans were at the ninth hole, for instance, they could access information on their phones showing which players were also on that hole, their scores, and where they were on the leaderboard. Fans could also track the locations of their favorite players no matter where they were. Information on each hole (distance, par) could also be accessed. 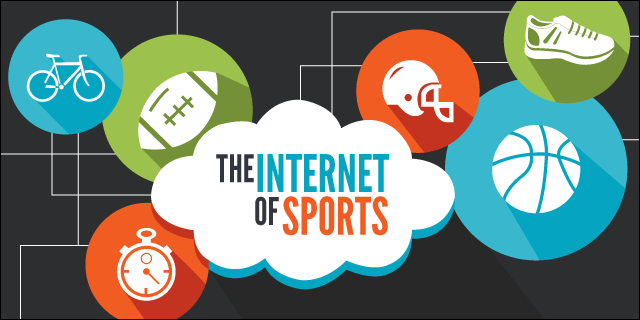 The Internet of Things has many applications, not the least of which are in the sports world. New insights are set to be gained that can be used by players, coaches, and trainers. Major changes may be on the horizon, not only for improving sports but for how fans experience them as well. As the IoT expands its influence and advances its technology, the sports world will find more uses for it, and the results should be both helpful and exciting.